Northbrook, IL — Yarn encompasses a wide array of crafts, including knitting, crochet, macrame, weaving, punch needle and much more. More than that, yarn encompasses a wide array of people. Rather than focus on one specific type of yarn project, the Craft Yarn Council’s fall 2018 campaign will focus on the people behind yarn crafts. 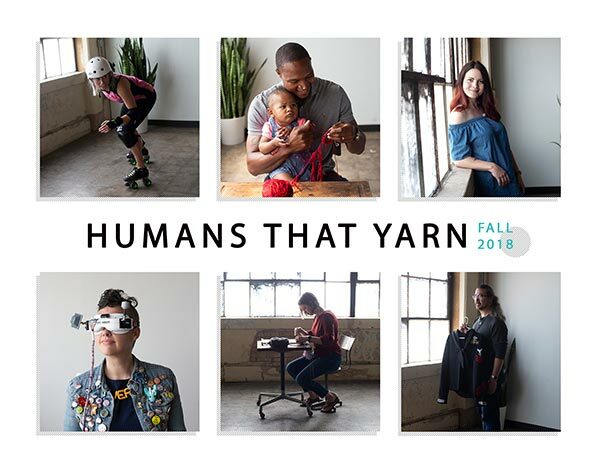 Humans That Yarn is an inclusive campaign that aims to showcase all the different types of crafts that can be made with yarn and the different types of people who identify as a yarnist. The campaign has several goals aimed at making the fiber world more inclusive. One of those goals is to break down the barriers of entry for people who may see yarn crafting as too difficult or uncool. Another is to encourage people who already craft with yarn to take up a new yarn craft. Craft Yarn Council studies have shown that the most common reasons for not participating in yarn crafts are lack of knowledge on how to get started (32%) and the perception that knitting/crocheting (and other yarn crafts) are difficult to learn (28%). Recent research has also shown that 48% of non-knitters and crocheters use yarn in other ways, whether they are wrapping yarn around a dowel for a wall hanging or around cardboard to make pompoms. Through social media interviews, videos, photography and blog posts, the campaign will increase interest and conversation about yarn crafts. The term “yarnist” will be introduced alongside the campaign to demonstrate that no matter how you use yarn, you are a “yarnist” (yarn artist). Visit FaveCrafts.com for project inspiration, including four original yarn crafts designed specifically to celebrate the Humans That Yarn campaign. Each project was designed with crafters in mind that may or may not know how to knit and/or crochet; each project uses yarn in a creative way that crafters of any skill levels can complete. For more inspiration, ideas and tips for teaching others a new yarn craft, free patterns, yarn project ideas, giveaways and more, make sure to check out the Craft Yarn Council’s website and social media pages, including Facebook, Instagram, Pinterest, and YouTube. Tag your posts with #humansthatyarn and #yarnist.